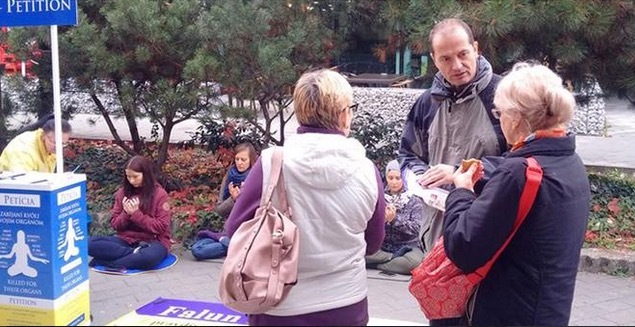 Falun Gong practitioners held events in Levice, Slovakia on December 21 and 22, 2017, to raise awareness of the Chinese Communist Party's (CCP) 18-year-long persecution of Falun Gong in China. 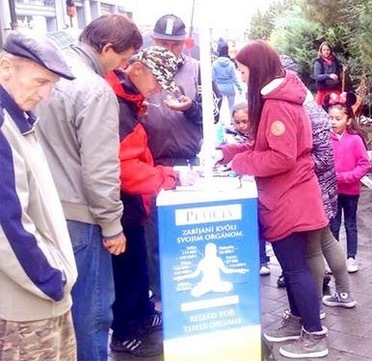 They also called for an end to the CCP's state-sanctioned harvesting of organs from living Falun Gong practitioners. The practitioners set up a table to collect signatures. 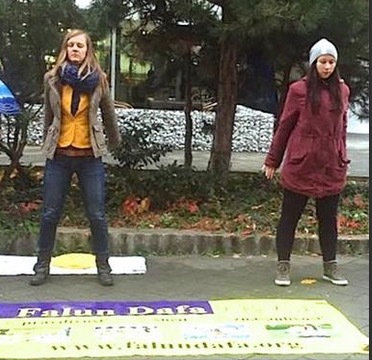 Some demonstrated the five sets of Falun Gong exercises. Others distributed flyers. Many people signed the petition against the persecution. A boy who signed the petition came back the next day to help the practitioners distribute flyers. He collected two signatures. She and her friends came back after a while to learn the exercises. They expressed interest in joining an exercise group in the park on Saturday.